Was born in 1957 in Ukraine (USSR). Currently lives and works in Ekaterinburg. He is a member of the "Russia Painters Union". He is a director of "The traditional Art and Craft Studio" (Ekaterinburg, Russia) since 1990. Professor. Has taken part in more then 40 personal and collective exhibitions. 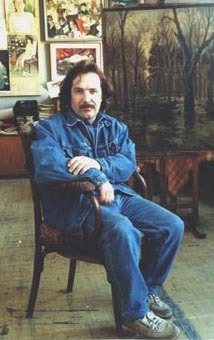 He was awarded a silver medal of the "Russia Painters Union". Has many diploma as the prize-winner of a few republican and regional exhibitions. His works are presented in private collections and regular expositions of many museums. Works in the technique of easel painting and graphics. Main preferences are landscapes, still lifes, genre pictures. "I am a romantic still believing in wonders and good. I do my best to make my viewers to believe in that. I love indeed to paint Ural and Ukrainian winter landscapes. Every picture of mine is many days hard labour. Any thing presented at the picture must be convincing. I can work several years with a picture, working out all the details thoroughly, preparing many sketches. But every picture shows just a fancy reality. All of them are composed of many pieces of reality like mosaic . It is more interesting for me to imagine then to copy. I create my own world at my canvas. I draw my inspiration in masterpieces of Brullov, Kuingi, Polenov, Savrasov, Shishkin." 2002 - Personal exhibition "The creative world of Alexander Mitsnik" in the "Russian Precious" exhibition hall, (Ekaterinburg, Russia).